This well-written and performed program documents the exploration of America by Lewis and Clark! "Clark And The Horse Thieves"
President Thomas Jefferson made an incredible gamble early in the history of the American Republic: The Louisiana Purchase. Although the commitment had been made, there was no way to know the full extent of the Purchase. Soon after the Purchase was made Jefferson convinced the Congress to appropriate $2500 to fund an expedition to survey "The river Missouri, the Indians inhabiting it... the whole line, even to the Western Ocean." 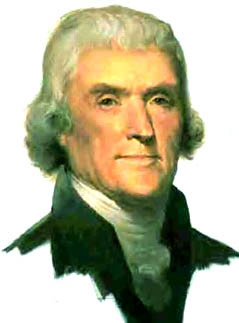 Jefferson chose a protege of his, a Virginian Army Captain, Meriwether Lewis, to lead the expedition. Lewis chose his friend William Clark as co-leader of the expedition, and they set out with their "Corps of Discovery" into the unknown wilderness. Horizons West was produced for the Armed Forces Radio Network at the Capitol Records Studio in Hollywood in 1962-63, and broadcast for Armed Forces Korea Network and the Far East Network in 1965. See also: Also see: Cavalcade of America, Democracy in America, The Free Company, Inheritance, You Are There, American Adventure, American History Collection, American Trail, We Came This Way, and Destination Freedom. We live in basically retirement community and I will put a notice in the bulletin about the pleasure and fun of listening to old time radio (and include your info). Love your site! It's brought back many happy memories from my parents!